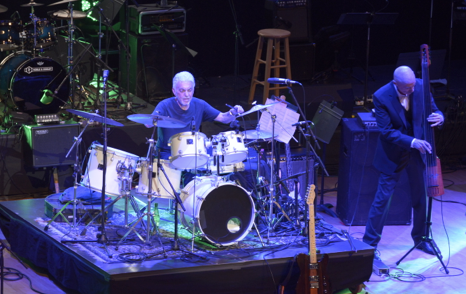 Steve Gadd with Tony Levin on stage Sunday night. Timing is everything. 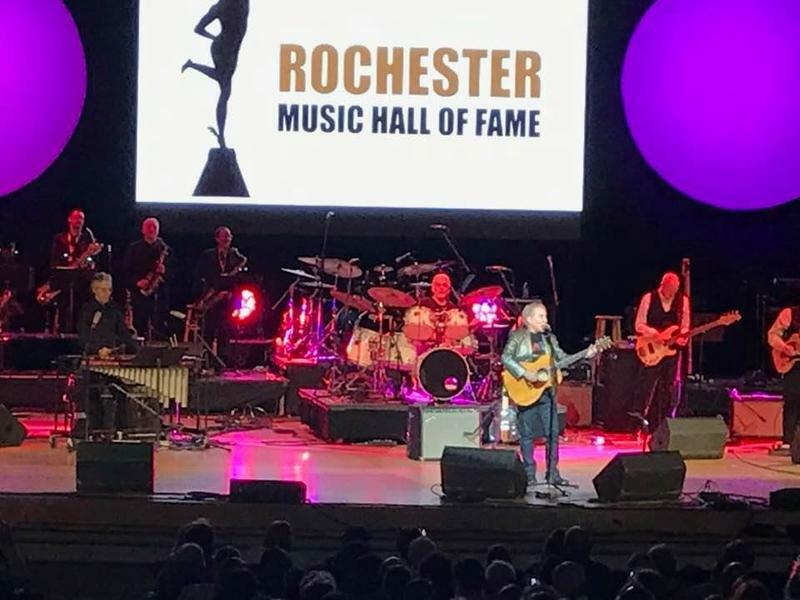 The announcement of an actual bricks, windows and door home for the Rochester Music Hall of Fame would have been the big surprise at any of the first six concerts honoring that year’s inductees. But that welcome news Sunday night, with the Hall of Fame set to go into the now-abandoned space at the corner of Gibbs Street and East Avenue, and hopeful of an opening before June’s Xerox Rochester International Jazz Festival, was easily eclipsed as the rumble of the last two days’ gossip was confirmed. 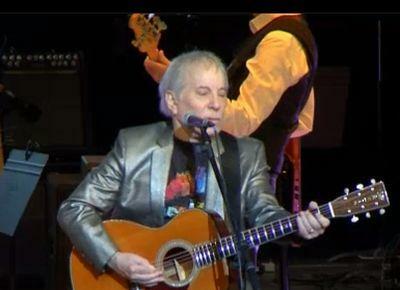 The big, big surprise: Paul Simon. Even before the Simon rumor, it was clear this seventh annual induction concert would be the first sell-out in its seven years at Kodak Hall at Eastman Theatre. Previous inductees Chuck and Gap Mangione, Lou Gramm and Joe Beard were among the 2,260 people here for the five new inductees. They came for Eastman School of Music percussion professor John Beck. Who begat one of his students to this class as well, drummer Steve Gadd. 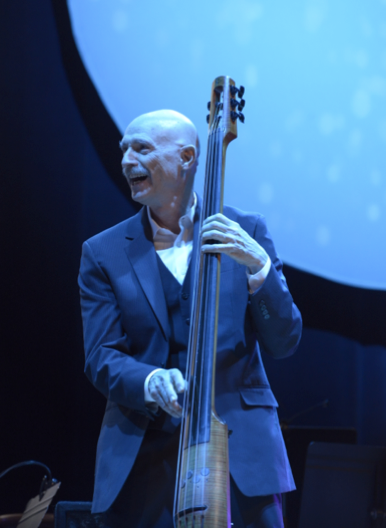 Who begat one of his rhythm-section cohorts, and a fellow Eastman grad, bassist Tony Levin. Add television-theme powerhouse Ferdinand Jay Smith and the group that took sacred-steel gospel to a new level of popularity, The Campbell Brothers. And then the guests. Simon. Sacred-steel star Robert Randolph. And a landslide of powerfully talented local performers, led by the amazing 10-piece house band, Prime Time Funk. Some of the problems from past shows linger. Too-long speeches that promised an end to too-long speeches. Introductory videos that said the same things as the people who introduced the inductees, who said the same things as the videos and the introducers. The result, a show that went almost an hour longer than its 10:30 p.m. target. But when the music hit the stage, there would be no need for the wheezing ’80s rockers who have been imported in the past to add a little name recognition to the night. Beck, who’s been on the Eastman faculty since 1959, played a marvelous set that opened with a timpani solo he wrote as a recital piece in 1968 for one of his students. That Steve Gadd. “I figure I’m now old enough to understand the history of percussion,” said the 85-year-old performer, teacher and writer. Smith started his music career as a 15-year-old DJ before he moved on to promoting shows for bands such as Led Zeppelin, The Rascals and Fleetwood Mac. 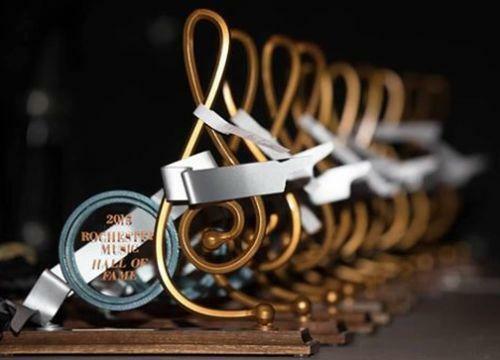 In 1973 he founded Jay Advertising, based in East Rochester, and began creating a string of musical themes and scores, many familiar to this day: The theme music for the 1980 and 1988 Olympics, HBO specials, movies, sports documentaries, even the theme song for Lifestyles of the Rich & Famous. His heavily-produced segment – a kitchen-sink showcase of singers, horns and strings – reached deep into his catalog of car commercials. Two local students landed the Douglas Lowry Award, named for the late president of the Eastman School of Music. Cellist Ben Doane, from The Harley School, and will be going on to Eastman. Singer Mark Mitrano, from Greece Athena, showed some diversity with “Il Mondo Era Vuoto” from the opera Light in the Piazza and “Bring Him Home” from the Broadway hit Les Mis. He is bound for the University of Michigan. Gadd and Levin were inducted as a matched set, the Rhythm of Rochester. They were young guys on the scene here in the ’60s, playing the clubs, studying at the Eastman School of Music, joining Chuck Mangione’s early bands as he was emerging as a jazz star. Two of the most dominant and innovative musicians in rock, pop and jazz over the past few decades. Gadd is the go-to sticks for Simon, Eric Clapton, James Taylor and damn near everyone else, including his own Steve Gadd Band. Levin is Peter Gabriel and King Crimson’s bassist, and a myriad of other acts, as well as his own projects. Gadd and Levin were joined Sunday night by their old bandmates from L’Image, a groundbreaking soft-jazz outfit that first appeared in the 1970s, although it didn’t release an album until 2010: Mike Mainieri, David Spinozza and Warren Bernhardt. Their songs were near-perfect jazz fusion: “Praise,” “Hidden Drive,” “The Brat” and “Bullet Train.” All performed as a lonely guitar sat at the front of the stage. The guitar was for Simon, of course. “Requests?” Simon asked after coming out to a standing ovation. He was showered by suggestions, but the two choices had already been made. “50 Ways to Leave Your Lover,” showcasing the immediately identifiable Army Corps riff that Gadd brought to open the song. And “Late in the Evening,” featuring Levin’s signature bass line. As if the Campbell Brothers’ room-shaking blend of gospel, country, rock, jazz and soul wasn’t enough – the band has played with The Allman Brothers, and Medeski Martin & Wood – it was joined at the show by sacred steel star Robert Randolph, who led a blistering version of Jimi Hendrix’ “Purple Haze.” That wouldn’t have happened without Chuck Campbell, who gave Randolph his first pedal-steel guitar, from the House of Guitars. In accepting their induction, electric guitarist Phil Campbell thanked portions of the local music community that often go unmentioned. Churches, of course, and The House of Guitars, who Campbell noted never questioned why black teenage musicians would want a pedal-steel guitar. And Chuck Campbell found yet another connection among this year’s nominees. Years ago, when he was working for Rochester Gas & Electric, he was called to fix a gas leak in Penfield. The repair done, the homeowner played some drums for Campbell, and encouraged him and his band – “Nobodies” at the time, according to Campbell – to keep playing. That homeowner and drummer was Steve Gadd. Jeff Spevak is a Rochester entertainment writer. You can read more at www.jeffspevak.com.